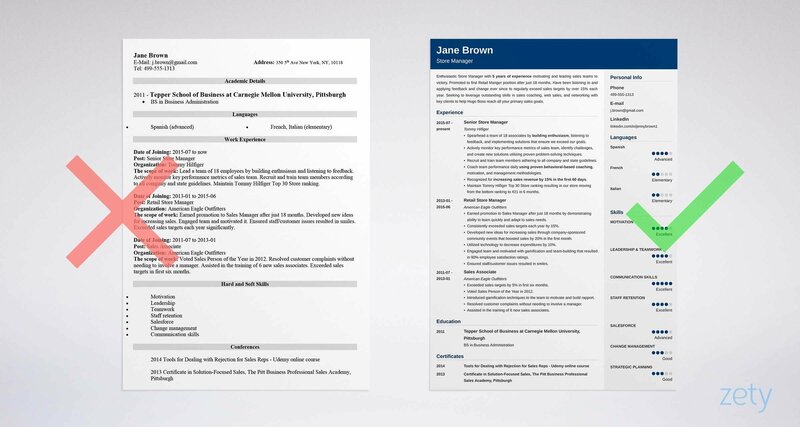 You’re one quick scroll-down away from seeing a pitch-perfect store manager resume sample. Better than that? You’re a 5-minute read away from learning how to write a professional store manager resume yourself. Being a good store manager is basically the same as having superhuman powers. You need to do so many things: hire, monitor sales KPIs, resolve peer problems, train employees, and help them reach their professional potential. All that, while still working the sales floor. And to land you that dream job, your resume has to prove that you’re great at all that! Seem impossible to do in a single document? Nah. It’s easier than you think. Read on, and let me show you. A store manager resume sample better than 9 out of 10 other resumes. How to write a retail manager resume even if you have no experience. Tips and examples of how to put skills and achievements on a store manager resume. How to describe your experience on a shop manager resume to get any job you want. Targeting other positions in sales and retail? What’s the Best Store Manager Resume Format? Statistically, recruiters spend just 6 seconds on every resume they get. They don’t read the whole thing. They skim it to find specific information. You have to make it easy for recruiters to spot all most relevant details on your professional store manager resume in a flash. Write your resume in the respected reverse-chronological resume format. Recruiters are familiar with it so they’ll know where to look for what they need. Plus, it focuses on the peak of your career—your current or most recent job will get the most attention. Here’s what to include in a good reverse-chronological store manager resume, from top to bottom. Pro Tip: Once you’re done writing your professional resume for retail management positions, save it in PDF. This way, you’ll keep your resume layout intact. Just remember to double-check with the job description if the company accepts PDF. If not—send your store manager resume in DOC. Store Manager Resume Objective or Summary? Exactly. An average one. And guess what? There’s a way you can make them read yours in full. Begin your retail manager resume with a short and sweet paragraph just below your contact information—it will be either a resume summary or a resume objective. Briefly explain what makes you the perfect candidate for this job. 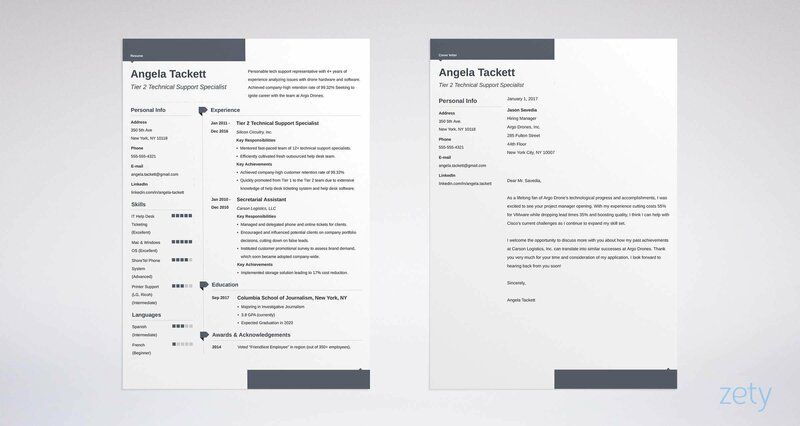 If you’ve got relevant experience, use a store manager resume summary. Give an outline of your career and list your top achievements. Writing an assistant store manager resume for your first managerial position? Switching careers? Go for a store manager resume objective. Discuss the skills you’ve mastered so far and how well you’d fit in. Every modern store manager resume summary or objective has to focus on what benefits your employer will get out of hiring you. Not how much you want the job. Alright, let’s see how good summaries or objectives for a retail manager resume work in practice. Check out the examples below. Goal-oriented retail and online store manager with over 7 years of experience in growing top line sales and supervising e-commerce, seeking to leverage outstanding skills in sales coaching, web sales, and networking with key clients to help XYZ reach all your primary sales goals. Increased ABC’s Florida online sales by 241% in 2017 through piloting of micro-sites. Experienced retail and online store manager with well-developed set of sales skills seeking to join a retail store where I could excel in my everyday tasks and responsibilities. The first store manager resume summary example lists verifiable, quantified achievements. Plus, it makes an offer the hiring manager won’t want to refuse. Now let’s compare two very different retail manager objective examples. Hard-working retail associate, skilled in POS tech and inventory management seeking to increase sales and customer loyalty as the new Assistant Store Manager at Chiller Outfitters. Devised and implemented a new control system for Tommy Hilfiger NYC which reduced shrink results from 4.1% to 1.65% within one year. Wow, right? This guy’s surely ready for new, managerial challenges! Successful retail associate looking to join a company for my first position as retail assistant manager. Skilled in all areas of sales, leadership, and management. Again, perhaps not awful, but it lists no hard data and makes no irresistible offer. Every recruiter would just yawn and move on to the next of the 300 resumes on their desk. Pro Tip: In every store manager resume summary or objective you write, address the company by name and indicate the position you’re targeting. That means you cannot send the same store management resume for every application. And that’s the point. Personalization works wonders! Writing the perfect store manager resume summary or objective can be tricky. For more expert tips and real-life examples, check out our handy guides: How to Write a Resume Summary and How to Write a Resume Objective. How to Write Your Store Manager Resume Job Description? Description of your previous positions is what matters most for recruiters and hiring managers. The thing is—they don’t want to read about what you did in previous jobs. That’s pretty much summed up in your job title. They want to know how well you did it. In your store manager resume job description, don’t just list your duties and responsibilities. Focus on accomplishments instead. Quantify whenever possible. Don’t say you “significantly cut inventory costs.” Say how much exactly. Numbers pop! Last but not least—pick phrases from the job ad, and refer to them in your work experience section. List relevant store manager responsibilities, not every single task you’ve performed. In other words: make a tailored or a targeted resume. Have a look at some examples. Successfully trained a total of 16 employees from retail associates to area managers. Supervised data entry, freight deliveries, negatives, and pack away procedures for accurate POS inventory. Recruited, interviewed, hired, developed, evaluated, coached, and counseled all local employees. Consistently ensured Payroll expectations were compliant and deadlines were met. Strived for 100% accuracy and compliance in cash and inventory levels. Key achievement: Fixed a recurring problem with in-store availability, reducing out of stocks by 48%, which led to sales increase of $112,000/year. With a job description like this, the hiring manager will want to call this candidate in the middle of the night! Alright, but what if you’ve never worked as a full-blown retail manager yet and are targeting your first managerial position? Well, the same rules apply. What’s most important is showing that you’ve got experience relevant to the position you’re targeting. Pay close attention to the job description. Highlight words that are related to your prospective duties. Then, ask yourself the big question—how many of these have you already done? Quite a few, right? Then include these in your store manager resume job description. Analyze sales statistics(1) to define sales potential. Ensure customer satisfaction(2) and resolve customer issues. Motivate(3), train(4), and coach sales staff while applying feedback. Monitor performance metrics(5) of sales team and report data. Consistently analyzed sales statistics(1) and team performance metrics(5) to ensure all major KPIs are met. Settled customer complaints(2) without needing to involve a manager. Introduced gamification techniques to the team to motivate(3) and build rapport. Assisted in the training(4) of new sales associates adapting feedback and adhering to company policies. 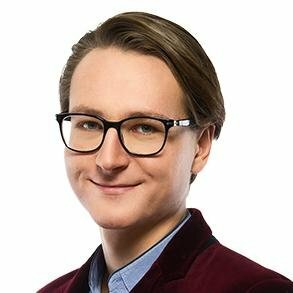 Key Achievement: Voted Salesperson of the Year in 2017. One thing to keep in mind: don’t cram past descriptions of your store management jobs with every task that will be expected of you in your new role. List only those duties that you are familiar with. Is your Education Underselling You? It Might Be. Since you’re applying for a managerial position, you’re probably not a recent graduate. Does that mean you can leave your education off? Most employers still expect at least a Bachelor’s degree from store managers. The rule of thumb is to list only your highest degree. But if you’ve got Master’s you can still include your Bachelor’s. Pro Tip: Writing a senior store manager resume? Leave your GPA off. For junior or assistant retail manager resumes, it’s still not mandatory. Include it only if it’s exceptionally high. How to Make the Most of Your Store Manager Resume Skills Section? Think about rolling a sales campaign for your retail store. Recent studies have found that the more personalized your marketing efforts are, the better the results. The same goes for your store manager resume skills list. For greatest impact, you have to personalize it. Recruiters don’t want to read long, unspecific lists of skills, entered in whatever order you see fit. What they want is to learn that you’ve got exactly the skills they’re looking for. Remember when I mentioned tailoring? Here it comes again. Check how many of these match your spreadsheet. These go in your resume skills section. Apart from putting your skills in the dedicated skills section, mention them also in the work experience section and your resume summary or objective. Business Development: Developed new business to push sales revenue from $44,000/yr to $212,000 in 18 months. Lead Conversion Solutions: Increased staff training to drive lead conversion up 20%. Budgeting: Cut inventory costs by 25% through annual trend analysis. See? That’s music to every hiring manager’s ears—relevant skills backed up with solid evidence of past success. Feel like you could use some inspiration with your store manager skills list? Have a look at this handy table that lists the most sought-after skills for a professional store management resume. Pro Tip: Always include a few of your soft skills in your store manager resume. This Harvard study shows that modern economy will increasingly reward candidates who combine technical with soft skills—that means more job opportunities and higher pay. Got all the above sections? Good. It’s a decent store manager resume. Not satisfied with “decent?” That’s the spirit! Let’s supercharge your store manager resume with an additional section. In it, show off your unquestionable achievements that set you apart from other candidates. Can’t showcase any of the above yet? Take it easy. An assistant or junior store manager resume or a management internship resume can still benefit from an extra section. How About a Store Manager Cover Letter? Yes, you need a cover letter in 2018. Because almost half of the recruiters won’t even bother to open your resume if there’s no store manager cover letter attached. No matter your industry or seniority level. Whether you’re writing a cell phone, jewelry, or liquor store manager resume, including a cover letter doubles your chances of landing your next job. Can’t argue with hard data, can you? Open your store management resume with a resume objective or a resume summary. Say what makes you a great candidate and make an offer. In the work experience section, focus on your achievements, not just responsibilities. Use action verbs and quantify whenever possible. Personalize every resume you send. Use the name of the company you’re applying to and tailor the contents of your resume to the job description. Got any questions? Want to chat about writing your resume? That’s great cause I can’t wait to hear your thoughts! Drop me a line in the comments and I’ll get back to you right away!